Make Temperance Landing 24 your northwoods home away from home on the beautiful shores of Lake Superior. Enjoy a beautiful, shared cobblestone beach located just steps away from the house. Temperance Landing is a 3 bedroom, 3 bathroom, 3-story home with an additional sleeping loft area. Located right on the shore of Lake Superior near Schroeder, MN. Skip rocks on the water or just grab a good book and sit back on the rocks to enjoy this amazing beach area. Large floor to ceiling windows in the living room allow you to take in the unobstructed views of Lake Superior. The living room features a flat screen TV with DVD and Satellite and a gas fireplace. The view of the living room from the loft area above. You will love the high ceilings and wood beams. The fully equipped kitchen has granite countertops and high-end stainless steel appliances. Open to the living room area, this kitchen is great for preparing a home cooked meal during your stay. And you can enjoy that meal in the dining room area, which has seating for 6 and great Lake Superior views. There are two folding chairs in the entryway closet for 2 additional seats at the table. The whole living area is wide open, so whether you are preparing a meal, playing a game at the table, or watching TV in the living room you can still interact with friends and family. The master bedroom features a king bed, gas fireplace, and deep soaker jetted tub. You also get a private side balcony through the sliding glass doors in the master bedroom. Imagine soaking in a hot jetted tub after a long day of exploring the North Shore. The pass-through bathroom allows guests to access the bathroom from the master bedroom or the hallway. The bathroom features a large vanity and glass walk-in shower. The second bedroom, located on the upper level, has a queen size bed and great Lake Superior views. There`s also a window that looks down over the living room area in the second bedroom. The sleeping loft has twin trundle beds and looks down over the living room. You can also enjoy the large living room windows for natural light and Lake Superior views. The bathroom on the upper level has a shower/tub combo. Located on the lower level, the third bedroom features two twin beds. Even though it`s located in the lower level, the large window allows in a lot of natural light. No basement feeling in this home The bathroom on the lower level has a shower/tub combo. The lower level laundry room is great for extended stays There is room for everyone in this spacious home. Send the kids downstairs to the lower level living room and enjoy adult time upstairs. The lower level also has a flat screen TV and a foosball table. Everyone loves a game of foosball The spacious deck, located off of the living room, has seating to enjoy a meal outdoors. Sit back with a good book or just enjoy Lake Superior`s antics. There`s even a gas grill available for enjoying a nice BBQ dinner on a warm summer night. Temperance Landing 24 is located right next door to the shared sauna in the green building. There is a garage available for guests and then you access the home down a couple of flights of stairs. Lake Superior views abound indoors and outdoors at this beautiful Schroeder, MN vacation home. From the moment you walk into the large open living space your eyes will be drawn to the sweeping, unobstructed Lake Superior views from the floor to ceiling windows in Temperance Landing 24. This luxurious log home is spacious and inviting and just waiting to be called your North Shore home away from home. Temperance Landing 24 is a 3-story home that boasts 3 bedrooms, 3 bathrooms, and an additional sleeping loft area. It has a large open living space with a living room, dining room, and kitchen. The kitchen features granite countertops with high-end stainless steel appliances- a cook's dream come true! The double sided gas fireplace in the living room and master bedroom creates a warm and peaceful ambiance to accompany the sounds of Lake Superior. In the master bedroom you will find a private balcony and deep soaker jetted tub. Enjoy the lake-facing deck off the living room area, as well as a lower level patio walk-out. Take a stroll down to the shared section of cobblestone beach where you can skip rocks into the lake or just find a comfy rock to lay back on and listen to the waves roll onto the shore. This home is perfect for a larger family or group of friends traveling together, with room for everyone and plenty of privacy to go around. At Temperance Landing 24 you are just a short distance from many area attractions. Father Baraga's Cross, a historical marker, is located right next door, easy walking distance or a short drive away. Temperance River State Park is practically in your back yard with miles of hiking trails and beautiful waterfalls. Lutsen Mountains Ski and Summer Recreation Area is about 15 miles away and offers both winter and summertime activities. Hungry for a bite to eat? Hop in the car and head up the shore and check out some of the great resort restaurants in Tofte and Lutsen, including the Bluefin Grille at Bluefin Bay in Tofte, Lakeside Dining Room and Poplar River Pub at Lutsen Resort, Moguls Grille & Tap Room at Caribou Highlands Resort, and Papa Charlie's Grill & Tavern at Eagle Ridge Resort. Each features live music from popular local artists throughout the summer. Grand Marais is about a 30-minute drive away for a relaxing day-trip to this quaint little town, featuring dozens of unique, locally owned shops and restaurants. Whether your next North Shore trip is to relax or to find an adventure, Temperance Landing 24 is a great central location that can accommodate a large group for a fun family getaway or a ski trip for a group of friends. Excellent - I reported an issue with the furnace, they promptly came and checked OK they didnt pursue it. I still dont think that the furnace is functioning quite right, the cycle time between heat cycles was way too short about every minute. Great home, beautiful views. Efficient check in in reservation process. had a plumbing issue and we called for service on Friday evening. the issue was promptly and professionally taken care of. Excellent for all of the reasons listed. Again, cleanliness was our only complaint. 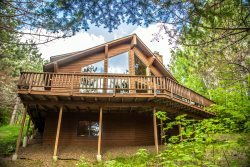 This house is in a wonderful location; Far enough north to get to Lutsen and Grand Marais without too much driving and far enough south to get to Split Rock and Gooseberry Falls easily. We loved being the end unit of the complex as it made the cabin feel very private, even though it isn't really. Wonderful views of Lake Superior and a nice beach that was easily accessible and hardly busy. Property was well appointed and clean. It isn't the fanciest house but we had everything we needed for a wonderful weekend along the North Shore!